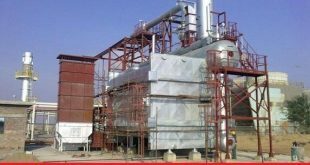 ESP means Electrostatic precipitator is a device have been used for over half a century to control particulate emissions or dust cleaning device in many industries like power plants boiler ,cement and steel mills. 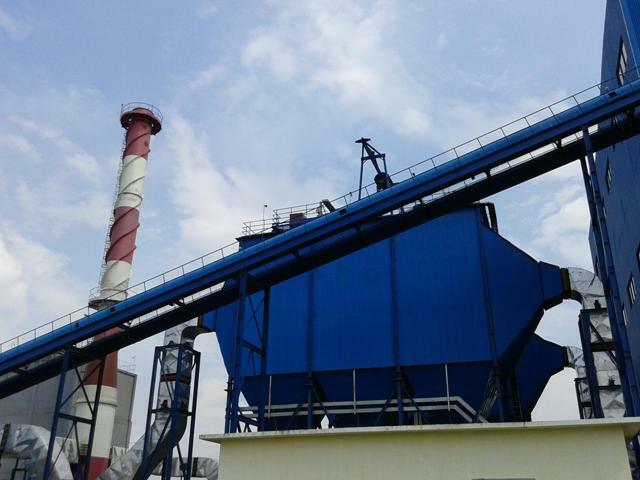 Electrostatic precipitators have a very high collection efficiency upto 99%. 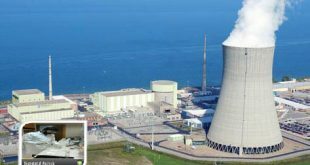 ESP can handle large exhaust gas volumes at high temperature 95°C to 950°C. 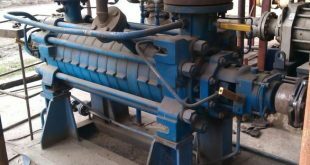 The ESP is installed for the purpose of separating the solid particles in the boiler flue gas from the oil fired boiler units. 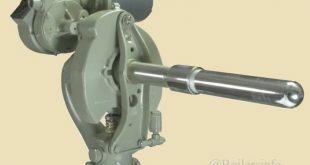 The flue gas is introduced to the ESP through the inlet nozzle and is expanded uniformly by gas distribution plate located in the inlet nozzle. The suspended particles in the flue gas are charged by negative corona discharge supplied from High Voltage Transformer-Rectifier unit through discharge electrodes and the charged particles are attracted to the collecting electrodes by electrical force. 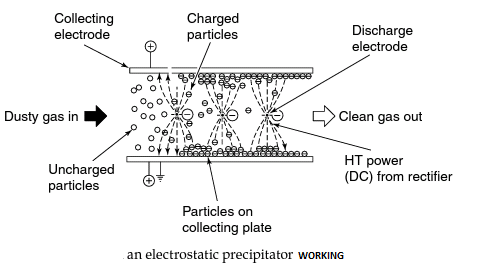 The particles collected on the collecting electrodes are removed by impact force of mechanical hammering system. 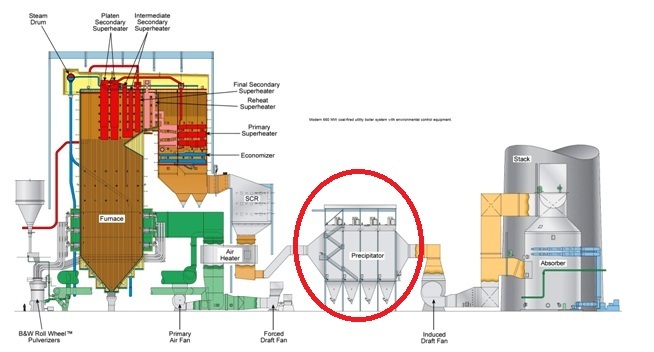 The removed dust is stored in hoppers and is transported to the ash silo by an Ash Handling system. Main parts of an ESP are Discharge electrodes, collection electrodes, electrical systems, rapper plates, hoppers, and a casing or shell. The collecting electrodes consist of individual roll forming strip which are designed to provide a smooth electrical charge and to provide sufficient mechanical strength to avoid tilting and deformation, and are made of 1.2 mm thickness carbon steel plate. The discharge electrodes are flat strip type with spikes made of 1.6 mm thick carbon steel plate, and are mounted on rigid pipe frames arranged vertically in the space between the rows of collecting electrodes. Each discharge electrode system is hanged by support insulators. The collecting electrodes rapping system is of the rotational mechanical hammer type which is arranged on each row of the collecting electrodes. Each row of collecting electrodes is rapped in sequence. The rapping system of each field is independently operated to minimize the dust re-entrainment. The rapping interval can be adjusted by setting the corresponding parameter to suit the particular gas and dust characteristics, and the rapping intensity is set at an adequate value considering the dust removal effect and the mechanical life time. 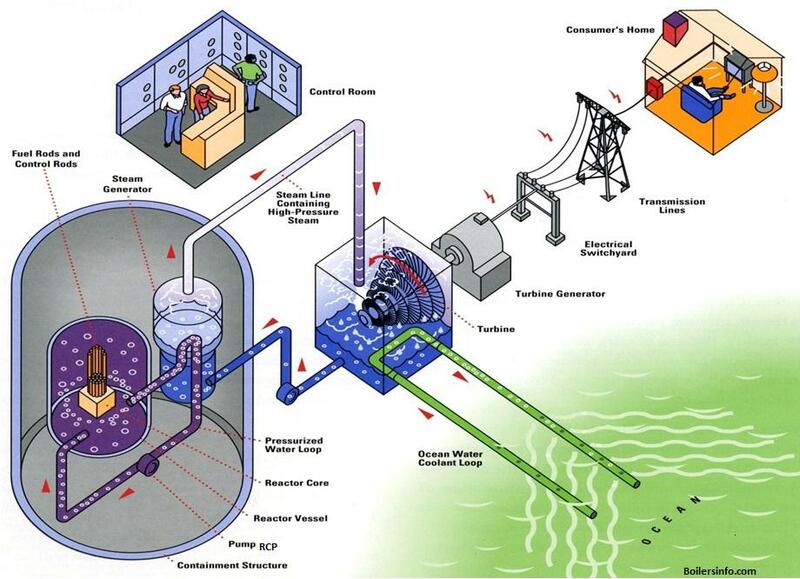 ESP is based on corona discharge which is a stable means of charging and collecting the dust particles in a flue gas. 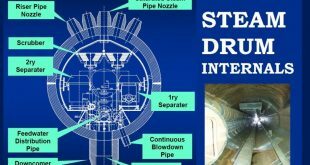 The dust laden flue gas enters the ESP through an inlet channel and passes through a gas distributor that distributes the flue gas evenly over the parallel arrays of discharge electrodes spaced alternately with collection electrodes. 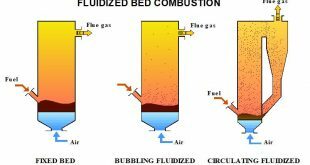 The Boiler flue gas flow may be horizontal or ver1ical. It can also be arranged in parallel or series. The discharge electrodes usually having negative charge in the form of a smooth wire energized 30-70 kV DC supply. The collecting electrodes come in the shape of plates. They are usually positively charged or grounded. The high intensity 30-70 kV electric field created causes the particulates in the gas stream to acquire negative charges transferred from ionized gas molecules of the same polarity. These charged dust particles accelerate towards the collection electrodes where their charges get neutralized, whereupon they fall into collection hoppers beneath the unit. Waves after waves of charged dust particulates migrate continually to the collection electrodes where they transfer their charge and fall into the hoppers by gravity or after rapping the collection plates. ESP can separate very fine particles up to 0.01 µ. High dust cleaning efficiency 98- 99.5%. ESP provides easy operation and minimum draught loss. But it is very costly. In case of high flue gas velocity its efficiency decreases. A large space is required to install an Electrostatic precipitator. Ideal location of an ESP is the upstream side of the air heater. It will keep the heat transfer surface of the air heater clean from dust and soot and air heater will work more efficiently. A mechanical cleaning device (Cyclone separator) should be installed before ESP to improve its efficiency, it will collect large particles.